1-Bedroom #1174: This property is amazing and the host was so easy to work with - responsive, flexible and truly cared about our experience. I would recommend this property to my friends and family. Studio #813: This was the most amazing balcony weve ever had in Kaanapali! Great view of the ocean, Koi pond below, mountains behind, and overall a great place to hangout. The location was perfect, steps to Whalers Village and the beach. We hope to come back very soon! Studio #1118: The unit was perfect for my husband and me. It was clean, comfortable and had all the necessary kitchen equipment to meet our needs. Enjoyed our morning coffee on the lanai watching the whales and an evening glass of wine listening to the surf. The Whaler is the perfect location in beautiful Kaanapali. Will definitely return. Studio #1118: Very clean, comfortable condo within a fantastic beach side resort. Spectacular views. Highly recommended. Studio #963: Loved the view, very nice condo. Whaler is a great location and has all of the facilities. Five stars! 1-Bedroom #1174: Very nice place. Bed comfy, couch comfy, everything was perfect. Loved the wrap around porch. This was our 6th time to the Whaler and when we come, it is like coming home. It is easy and we have everything we need and are in close proximity to restaurants and shopping, great beach and lovely pool. When we want a vacation to truly relax and recharge, we come to Maui and stay at the Whaler. Studio #1118: We visited in February to see the whales, and we were not disappointed. Maui whales are something to see, and the whalewatch tour from Lahaina was excellent...but so was the view from the lanai of this room! Whale spouts, splashes, and breaches were all visible from the lanai; granted, a pair of binoculars helps, but this setting was great. The view looks toward Puu Kekaa (Black Rock), and there is fantastic snorkeling around that rocky point; its an easy walk, and while underwater, we heard whalesongs as we snorkeled amid hundreds of colorful fish and a sea turtle. The studio setting was great for the two of us, and the well-appointed kitchen area had everything we needed and more. The owners and manager have a gem of a unit, and we really appreciated the personal touches that made it feel so much more comfortable than a hotel room. If youre looking for a good place to stay, if this ones available during your time, its well worth considering. We will certainly be ready for this one again on the next trip to Maui. 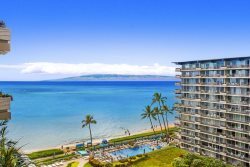 1-Bedroom #1174: Ideal location in the heart of Kaanapali. Very comfortable unit, with a private wrap around balcony. Would definitely stay here again. Studio #715: Best views in Kaanapali! What a wonderful place to stay right in the heart of town. Plenty nearby to see and do! 2-Bedroom #923: Awesome. Beautiful condo. Spectacular views. Location amazing! Well come back! 1-Bedroom #1074: This place was amazing; I never wanted to leave. I appreciated the underground parking, the gym was small but well appointed, and the unit itself could not have been any better. The views were amazing and the location cannot be beat. Truly an amazing place. Studio #1062: Room with a View! The lanai of this room is gorgeous. Protected from the wind and hot afternoon sun, we sat here may hours watching people, waves, whales, and rain. It is the ideal location. Quiet and comfortable. The catamarans pick up passengers on the beach just south of the unit. From this unit you can walk all the way to the Papakea north or to the Hyatt Regency to the south or just around the corner to Whalers Village. If youre really ambitious, you can walk all the way to Lahaina. Just make your way to Hanakaoo Park and then walk along the guardrail. We had a fabulous stay! You will too! Studio #965: This condo was amazing. Words cannot describe how convenient, stylish and accommodating this location was. The condo was very clean and had everything we need for 7 days. It had the essentials for cooking breakfast (oil salt pepper honey etc). The beach is very close and the market was next door. You made our honeymoon perfect! 1-Bedroom #411: Fantastic location, matches images, awesome amenities. 1-Bedroom #411: Great location, amazing view from the balcony. Apartment fully equipped - sand toys, kitchen, everything we needed. Right on the beach and 1 min walk from restaurants and shops. We had a great time!! Studio #813: It was our first time in Maui and my husband and I both agree that it was our best vacation ever, and would have loved to have stayed longer. The weather, the room, the view, the whales, the water, the people -- everything was wonderful. We did not want to leave - and would love to return! Studio #715: Thank you for having me in your wonderful condo. It exceeded my expectations and was exactly what I needed to make my stay in Maui a dream! A spacious, well equipped condo in a great location with all the amenities of the resort. Ill be back! Studio #1062: We had a great time at The Whaler. We loved the proximity to the beach, just steps away from our condo. They also had a rental station with snorkeling gear that my husband loved and I loved the complimentary beach chairs! Front desk was very welcoming & friendly. Grounds were beautiful. It was also right next door to the Whaler Village shopping center with some great restaurants and shops. 2-Bedroom #923: This property is lovely. The view is outstanding of the ocean and especially the mountains. The unit is very spacious and the Whaler staff is accommodating and very friendly. The beach, pool and Whalers village is at your finger tips. We dined out as well as cooked in and found the kitchen accommodations in satisfactory condition and well appointed. We cannot wait to return! 1-Bedroom #557: Our home away from home. We try to visit Maui every year and always stay in this unit. It is absolutely perfect for us, fabulous location, well stocked and you cant beat those views. 1-Bedroom #401: We choose this property over many others because of the view. It did not disappoint. Excellent ocean and mountain views from the very large lanai. It was so relaxing to hear the surf during the day and night even with the doors and windows closed. We will stay here again. Studio #963: This condo has an incredible view. It was clean and even had beach chairs and a cooler for us to use. It is a wonderful property. 2-Bedroom #1102: What a beautiful location on a magical beach! Kaanapali is a great spot for a relaxing family beach stay, and the Whaler is right at the center of it. This unit is literally one of the two best at the Whaler in my opinion: The wrap-around lanai with a wrap-around view of the ocean is awesome, with floor-to-ceiling windows. The west & north-facing panorama of ocean & Black Rock is especially gorgeous, from sunrise, to perfect sunset, and then even after dark. The height of the unit (11th floor!) & the North tower location means your views are completely unobstructed and youre so high up you can skip the helicopter tour. I would definitely seek this unit out again the next time were coming to Kaanapali with the family. For the price and the amenities of home, its was such a better value than two rooms in a hotel. Studio #1118: I cant say enough good things! For the price compared to close by resorts, it is a steal. Pool, towels, chairs, concierge, and more - all included!! The location could not be better. Walking distance to all the Kanaapali restaurants, shops, etc. We grabbed coffee each morning from Whalers Village, right next door! The apartment itself has fantastic views - sunrise over the mountains and sunset over the ocean. A view of beach and Black Rock right out front. Being on the 11th floor, it was extremely quiet and peaceful. The balcony was great and we ate breakfast there each morning. Speaking of, the kitchen was so nice to have!! If youre staying longer than a few days, having the kitchen is crucial! The bathroom was nice, the shower was a little used/worn but nothing that bothered us at all. The decor is very older Hawaiian but that made it all the more special. The photographs look exactly like the place, so you see what you get! We would stay here again absolutely. If were ever in Maui again, well be back! Thank you for the perfect Honeymoon stay.